Our index climbed a little higher in November, but underlying data gave little cause for cheer. Exports and rail freight volumes tumbled, investment in residential property suffered the steepest fall since Breakingviews records began in 2008, and pollution hit a 13-month high. 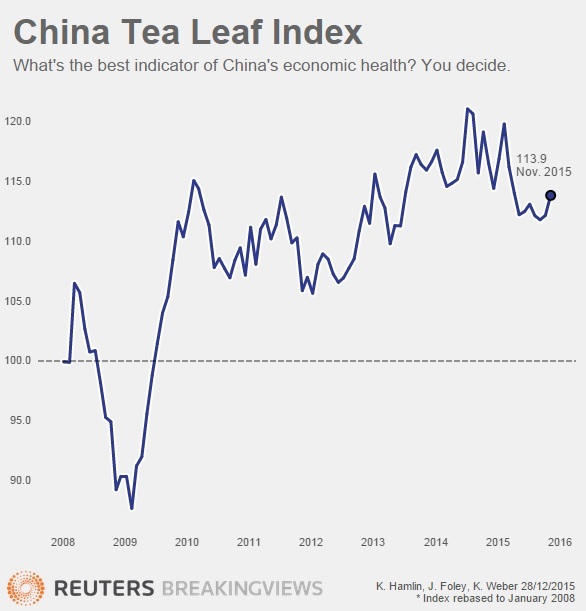 The Breakingviews Tea Leaf Index, an alternative measure of China’s economic activity, gave a reading of 113.9 in November, up from 112.2 in October. Investment in residential property development fell by 4.7 percent year on year in November. That was the steepest fall in the Breakingviews data set, which begins in January 2008. Exports fell by 7.2 percent and rail freight volumes fell by 15.5 percent in the same period. Beijing’s air quality was at its worst in 13 months, according to the U.S. Department of State. The concentration of small pollutant particles in the atmosphere averaged 132 PM2.5 per cubic metre in November.